"Schwarzwaldflair and Baden Cosiness for everyone." Our cuisine always offers something special, also in the early morning hours. Besides Badisch specialties you´ll find a wealth of well-known regional dishes and international delicacies. As ideal dining companion we serve wines from Freiburg, the Kaiserstuhl, the Markgräflerland and the surrounding area. With beers from local brewery Ganter are also well cared for beer lovers. From Monday to Sunday (No day off), we offer from 12.00 am in the morning until 1.00 am hot meals. 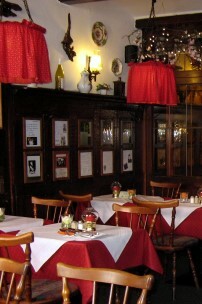 von 12:00 p.m. noon to 01:00 a.m.
Our restaurant seats up to 60 seats. For groups and travel companies from 20 people we will gladly make you a special offer.